North Wind Stables’ staff provides a supportive introduction to the exciting world of showing horses with this entry level program. Students who wish to test their newly-acquired skills may choose to participate in North Wind's Academy Program headed up by director Erin McCracken. The American Saddlebred breed association and other professional groups across the country support this entry level program for novice riders of all ages. 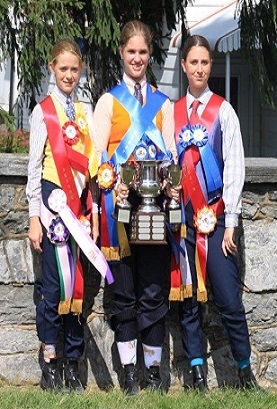 Many of the horse shows have a division of classes specifically for Academy where students compete within their own age and ability groups on lesson horses. (see below our show schedule for NWS's Academy Team) Riding attire is kept at just a shirt, tie, vest, jodhpurs, boots and a riding helmet as you see in the picture to the right. The Academy Program makes showing a horse affordable for nearly everyone. There is no restriction as to how long you can remain in this program to enjoy and compete with horses. If one day you are interested to own or lease your own horse you can graduate to compete in the amateur ranks at horse shows and events across the country reaching to international competition. 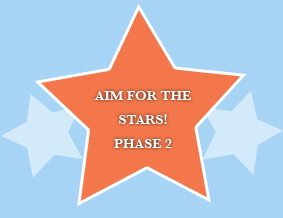 When you are ready to move ahead Click the Aim for the Stars Phase 2 button to the right.